Irish desert recipes are favorites among the people of Ireland as well as those from other countries. You will find delicious deserts made in homes, bakeries, and restaurants throughout Ireland. Irish food and recipes are enjoyed all over the world today; the traditions have been preserved and shared by emigrants relocating to new countries for years. Among the Irish dessert recipes are Irish whiskey cake recipes, recipes for Irish wedding cake, an Irish bread pudding recipe, Irish cookie recipes, Irish cream cheesecake recipes, and an Irish cream fudge recipe. You will want to try several Irish desert recipes and add your favorites to your traditional Irish meals. Here is an apple cake recipe that my mom, Elizabeth, makes as a special treat with fresh apples in the autumn of the year. Give this recipe a try! Beat egg with a fork in a 1 cup measuring cup. Add enough milk to fill the cup. Add egg mixture and dry mixture alternately to butter and sugar mixture. Put into a 9"x13" baking pan. Top with thinly sliced apples and then add the topping. Bake at 325 degrees for 45-60 minutes until lightly browned and baked throughout. 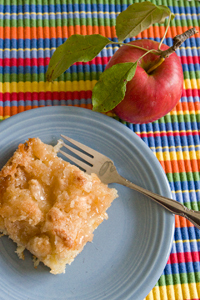 You may want to serve this apple cake with whipped cream or ice cream and coffee or tea. Enjoy! 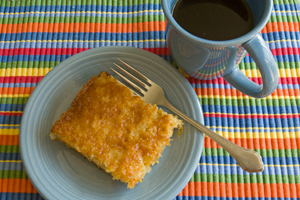 Here is a pineapple cake recipe that my mom, Elizabeth, makes for an afternoon snack with coffee or tea. You won't be sorry if you give this recipe a try! Grease and flour 9"x13" pan. Combine flour, pineapple, sugar, baking soda, eggs, and pour into the pan. Bake at 350 Fahrenheit for about 40 minutes. Cool. Frost cake if desired. Whip cream cheese and butter together. Then add vanilla and enough sugar to make icing spreadable.